PHILADELPHIA -- In the wake of Sunday's drama with Carolina Panthers safety Eric Reid,Eaglesdefensive back Malcolm Jenkins spoke on Colin Kaepernick's place in the social justice movement and the importance of presenting a unified front for the good of the cause, all while working in a jab at theJacksonville Jaguars' quarterback situation. The riff between Jenkins and Reid, which spilled over onto the field Sunday, stems from an agreement between the Players Coalition and the NFL in which close to $100 million was earmarked for causes considered important to African-American communities. Reid, the first teammate to protest alongside Kaepernick, believed Kaepernick should have had a larger seat at the table and said Jenkins "co-opted with the movement that was started by Colin to get his organization started. It was cowardly. He sold us out." Jenkins sees the problems surrounding the league's handling of Kaepernick and the drive for social justice as two separate, if connected, entities, which he expressed Wednesday, in a way that also took a swipe at Blake Bortles & Co.
"While our main focus is always on the community and those systemic oppressions, how we can leverage our relationships, our access and resources to help people in everyday communities, there is still a responsibility to speak out on Colin Kaepernick, who started this movement and still doesn't have a job," Jenkins said. "I wholeheartedly believe he is being blackballed, to speak out in support of Eric Reid, who put his job on the line to fight for those who didn't have a voice. "I have always maintained every chance I get to say, Colin Kaepernick started this, Eric Reid deserves a job, Colin Kaepernick deserves a job. I can turn on the tape this week and our opponent and see Colin Kaepernick deserves a job. But at the end of the day, when I started this, my personal journey to help my own communities, it was never about the NFL or anybody having a job in the NFL. It was about people -- everyday citizens where I come from, where I live in Philly, and all across this country. And so at the end of the day, my decisions will always be about people." Reid had to be restrained by an assistant coach and an official pregame, and he went out onto the field during the coin toss to confront Jenkins, who was serving as a captain. Eagles defensive endMichael Bennett, who has joined in protesting during the national anthem and has been outspoken about social justice issues, weighed in on the spat. He likened it to one guy driving a Ferrari and another a Suburban who are heading to the same destination. "It doesn't matter how we get there. They both want the same thing. I think that's the main thing, is focusing on how do we come together as individuals and as a community and collaborate on everything," Bennett said. "Fighting each other is not the answer. When you show violence is the answer, you give young kids a bad example. To be able to have a conversation and move forward in a positive manner is where we really want things." Reid and others left the Players Coalition right before the agreement with the league came down last season. Jenkins said that it would have been "naive" to think everybody was going to agree when it came to approach. He explained that he tried to involve as many voices as he could and represent their different interests to the best of his ability, adding that the Players Coalition acts like a democracy, with each member getting a vote before moving forward on something. If there is a primary disagreement with Reid from Jenkins' perspective, it is that Reid's grievances were aired publicly. "I was always taught by my parents, things that happen within the family stay within the family. Nobody wins when you see bickering or fighting or going back and forth. So, I always try and maintain positive vibes whenever I'm speaking about anybody who I know is passionate about their work," he said. "We can disagree on philosophy, we can disagree on tactics and all of that, but if I know where your heart is and I know that you're about the people, then never would I publicly bash what you're doing, because that it's detrimental to the movement. "But I know how passionate these guys are about these issues, how deeply rooted they are and how many wounds there are when we talk about racial inequality and all of the things that have happened to African-Americans in this country. It raises a lot of passion and it's sensitive, so I understand where we are in the context of that." 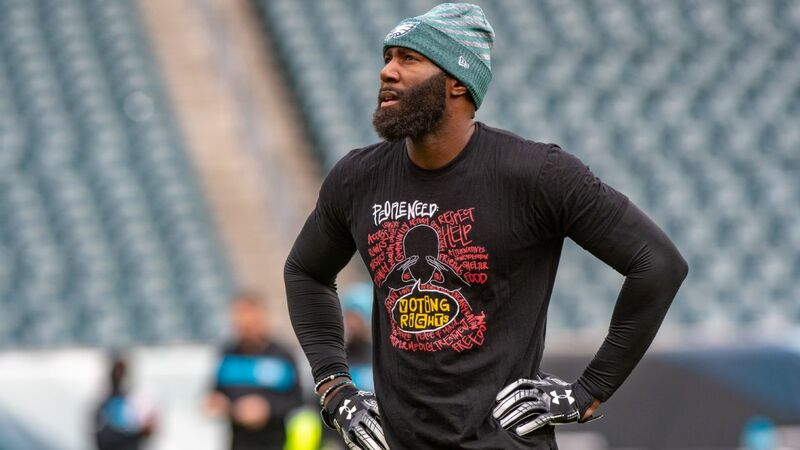 Malcolm Jenkins points to the Jacksonville Jaguars as evidence of why Colin Kaepernick and Eric Reid deserve roster spots in the NFL.